Botox is a real drug – despite what the media say – obtained on prescription from a qualified person; a doctor, dentist or nurse prescriber in the UK. Many other countries are far stricter about who is allowed to prescribe and administer Botox, such as in Australia where dentists are only able to prescribe it for perioral use, or in Spain where the treatment can only be administered by a doctor, and in France where some procedures can only be carried out by a dermatologist or plastic surgeon. As a long-time user of Botox and Allergan products in general, they invited me to have a look around the factory. It was a great perk for using the product, and really educational. The factory is based in Westport, Southern Ireland, and the nearest airport is Knock, which is a tiny little airport. I’d only ever been to Belfast in Northern Ireland before, so this was quite fun and totally different. Westport is this cute little town with a population of 5,000, and 1,400 of those people work at the Allergan factory! The town itself is like stepping back in time, with shops adorned with hand-painted signs, and their use of the Euro quickly reminded me we were not in the UK anymore. We of course went to a pub to sample Guinness, which was pretty good, despite being really calorific. In the evening the pub became really lively with lots of music and dancing – just like Ed Sheeran’s music video for Galway Girl! The factory itself is deceptively large. We learnt about how the original owners of the brand came over from the United States and settled their factory there because the owner was a keen horticulturist and liked the surrounding scenery. As I mentioned earlier, their discovery of Botox as a cosmetic intervention was a mistake. They were using it for ‘blepharospasm’ (uncontrollable and often painful muscle contractions around the eye) and it was being made for this purpose, and some doctors in the States wrote a paper saying that their patients were coming back even after the problem resolved because they liked the cosmetic effect. Nobody thought it would turn into the industry it is today. So, the factory gradually grew as the product become more popular, and the rest is anti-ageing history! I was amazed at how much effort goes into making one vial of Botox; the glass vials the product comes in, the labels, the bungs – everything is triple-checked for quality. They use the same manufacturers for everything because they don’t want to change anything in the supply chain which might affect how the product works. The glass is sterilised and weighed, there is a guy inside the room in this insane gear whose job it is to sit inside and move as little as possible. They actually hire people presumably on their ability to stay completely Zen for about eight hours, which would drive me totally crazy! The toxin is mixed with saline and sprayed into the vial through the bung, there are machines that check the pressure inside the vial, the humidity, then another machine puts the metallic stopper on, again checked for weight at all stages. It’s visually inspected by a human who has to change shifts every 15 minutes to prevent fatigue. There are invisible holograms printed onto the boxes and also a couple of visible ones as well, as there is a real problem with counterfeit products, especially from China, and the problem is you don’t know how much toxin is in there, leading to inconsistent results or possibly something more serious. Everywhere is constantly being checked for contamination and all of the batches are examined so many times. One well-oiled machine! 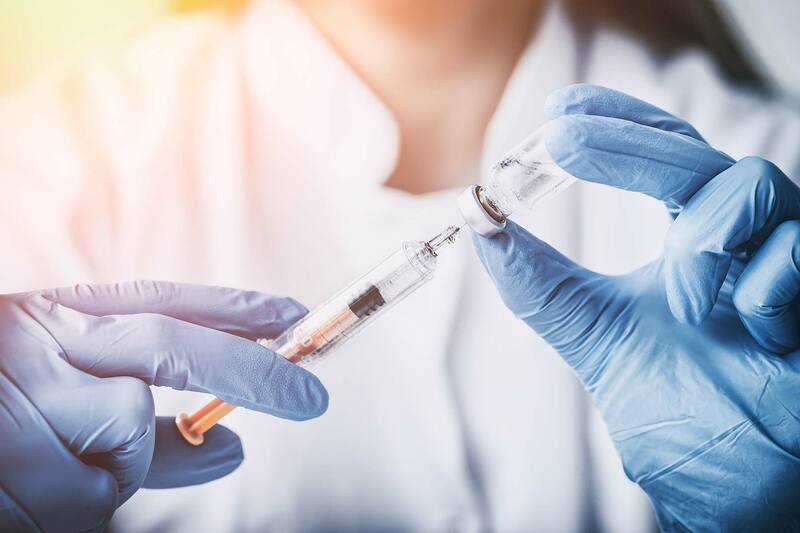 The botulinum toxin is made in the United States and brought over by plane once or twice a year for reconstitution, and apparently it is so potent that it only takes one to two grams of the toxin to make the world’s supply of Botox every year. But remember that Botox is a trade name, owned by Allergan, so there are other companies who make botulinum toxin, and they may have a different process. When I left, I was really in awe of how much effort goes into the production of such a high-quality product, something I am reminded of every time I open the fridge to take out a vial. So much research and development has gone into the production of that vial, I think I have a newfound respect for the product. And with an ever-increasing market for it, I will continue to have new clients knocking on my door who up until now wouldn’t have given it a second thought. It’s an ever-growing anti-ageing phenomenon. Find out more at https://www.allergan.co.uk. Are you loving the results of Botox? Tweet me at @TheLovely Clinic!